The 04 Series is starting at $1299. Our most popular 07 Series is starting at only $1699. Finally, our gorgeous 09 Series is priced to start at an unbelievable $1899.00. Call Us for all the details – 800-289-5810 or fill in the form below! Did we mention it was Free to try one of our handmade acoustic guitars? 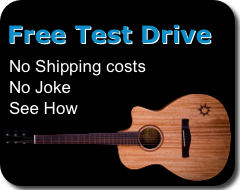 Ayers Guitar USA will send you a guitar to test drive for 21 Days.  Purchase an Ayers guitar from Ayers Guitar USA and we’ll give you 60 days to try it and see how much you like it. 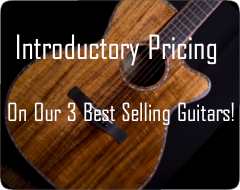 We do this because we love our guitars and think you will too. We believe you should find the right guitar for you, even if it’s not an Ayers. We even pay for the return shipping. The guitar must be returned in like new shape; without dents, scratches, stains, modifications or any other stuff people do to a guitar that alters it from new. People we think might try to abuse this program will be notified of a possible restocking fee prior to purchase.